Beatrice has grown up in the Abnegation faction, which values complete selflessness.Yet she's always struggled to be as selfless as her family. As a 16-year-old, Beatrice will soon have to decide which faction she'll spend the rest of her life with. While she doesn't want to leave her family and insult their values, she longs to join the Dauntless, the faction that values fearlessness. After the Choosing ceremony, Beatrice (who soon rebrands herself as Tris) discovers that being accepted by a faction is no easy process. 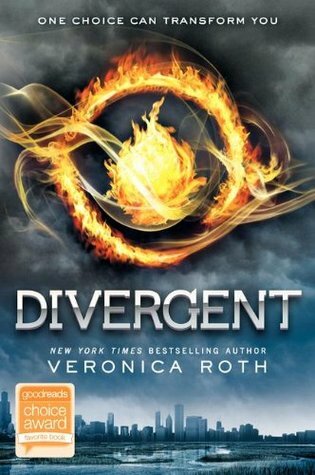 There are intense physical and psychological tests, and Tris must prove herself or wind up factionless. And through it all, she has to keep her secret, that's she's Divergent, which her society fears most of all. It took some time for me to connect with Tris. I think that's mostly because there is no way I would ever choose Dauntless. It just seemed so unappealing to me. And I didn't like how some of the factions were so vilified, especially Erudite, the faction that values intelligence. I can't stand that they're portrayed as the bad guys! I totally would've chosen Erudite. But, eventually Dauntless won me over. I still wouldn't choose it, but it gained my respect. Particularly the way Tris and Four view it. Also, this book gave me a strangely strong urge to get a tattoo. Possibly my favourite thing in this novel was the fear landscapes. The idea of going into a holographic simulation that puts you through your worst fears is just so cool. Though I didn't really understand the process Tris went through to overcome each one. It makes me wonder what would be in my fear landscape. And how many fears I would have. 3 stars. Writing this review months later, I feel more positive about it and can't really remember why I gave it only 3 stars. But I always go with the rating I choose right after finishing. In any case, I'm looking forward to the second book!